Harrison Hunt and Bill Bleyer. 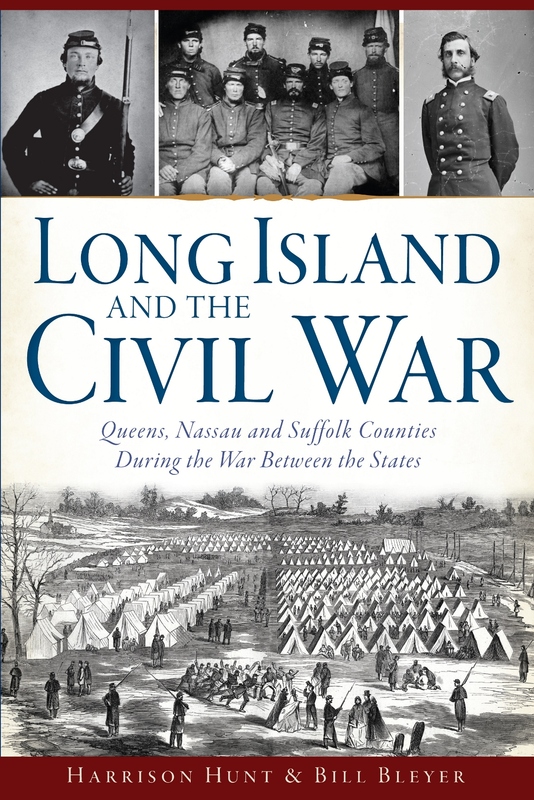 Long Island and the Civil War: Queens, Nassau and Suffolk Counties During the War Between the States. Charleston, SC: The History Press, 2015. Pp. 170, photographs. ISBN: 9781626197718. Paper, $21.99. This book fills in an important gap in Long Island’s history. No major Civil War battle ever occurred on Long Island, yet Long Islanders played major roles in helping to determine the outcome of the war. This work is typical of books published by The History Press (now owned by Arcadia Publishing) – small, manageable, and concise, yet very readable books. 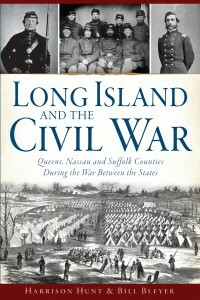 The topics covered in this volume are relayed in chronological order starting with the background of Long Island in 1860 and the war’s prelude. The meat of the work is the coverage of the actual units in which Long Islanders served, broken down numerically, and then featuring some of the specific soldiers that served. This is not the typical “unit history” as can be found in works such as Phisterer’s New York in the War of the Rebellion. Hunt and Bleyer’s account provides the basics mixed with local figures and the towns they were from, making for an enjoyably easy read. All but two of the illustrations, both photographs and engravings, are contemporaneous with the period the book covers, lending a proper feel to the volume. Harrison Hunt’s and Bill Bleyer’s backgrounds in history and journalism contribute to provide the reader with a detailed, yet moving account of everyday life both on the battlefield and here at home. Through the private entries in soldiers diaries, and the extensive use of local newspaper accounts, the book brings to life the actions and thoughts of Long Islanders during and after the war. This, along with the author’s extensive research in local institutional archives, provides the casual reader with just enough information to be satisfied, yet the endnotes and bibliography allows the researcher to pursue more in-depth information if desired. Homefront subjects mentioned include Confederate sympathizers (aka “copperheads”, “secesh” or “snakes”), local training camps and forts, Soldiers’ Aid Societies, the erection of Liberty poles, and the Brooklyn and Long Island Sanitary Fair. In addition, two Long Island literary giants are discussed – William Cullen Bryant and Walt Whitman. The role of both African American and Native American Long Islanders is covered in a separate chapter, including the five who served in the 54th Massachusetts Regiment, whose story was told in the movie Glory. Oyster Bay residents covered include David Carll, whose great-great-granddaughter, the actress and former Miss America Vanessa Williams, researched him in an episode of TV’s Who Do You Think You Are?, featuring Oyster Bay Town Historian John E. Hammond. There are surprises to be found in this volume, such as the fact that the Wantagh Fire Department displays the ship’s bell from the Civil War gunboat USS Pinola outside its headquarters; it was formerly used in the original firehouse. Much more obvious to the observant driver is the gun from the USS Hartford, Admiral Farragut’s flagship during the Battle of Mobile Bay, in 1864; this is driven past each and every day by thousands of drivers on Sunrise Highway in Freeport, a fortunate survivor of the scrap drives of later wars. The book concludes with post-war activities, such as the erection of appropriate monuments, and formation of Grand Army of the Republic (GAR) posts. This is followed by a discussion of modern day reenactment units. My personal complaint (being “old school”) is that I prefer footnotes as opposed to endnotes, for the ease of being able look down at the bottom of the page for additional information, rather than fumbling back and forth between the section I’m reading and the back of the book trying to see what the note refers too. This is not necessarily a fault of the authors, but more a stylistic concern. As an appropriate disclaimer, I must state that I was both a co-worker of Harrison “Terry” Hunt and a fellow Civil War reenactor, who in 1980 (along with Terry) was one of the four employees of Nassau County’s Old Bethpage Village Restoration that formed the Co. H, 119th New York Volunteers Historical Association, one of the oldest reenactment groups still in existence. Bill Bleyer’s and my paths have also crossed on several occasions with me providing research information to Bleyer on Civil War and Long Island topics. That said, I thoroughly recommend this work for anyone who wants to know more about Long Island’s role during the Civil War, without being overwhelmed by muster roles or regimental histories, or having to search through numerous local histories and institutions, and still not finding what is located here!